If an outfit is amazing, can you use it the next Halloween? Well, that was the question I was thinking this year, as we hadn't had the time to plan anything special for Halloween. Luckily, one of the three outfits from last year was just so darn adorable I couldn't help but to resurrect it for this Halloween. Afterall, last Halloween we had three different choices, and ended up using just one. 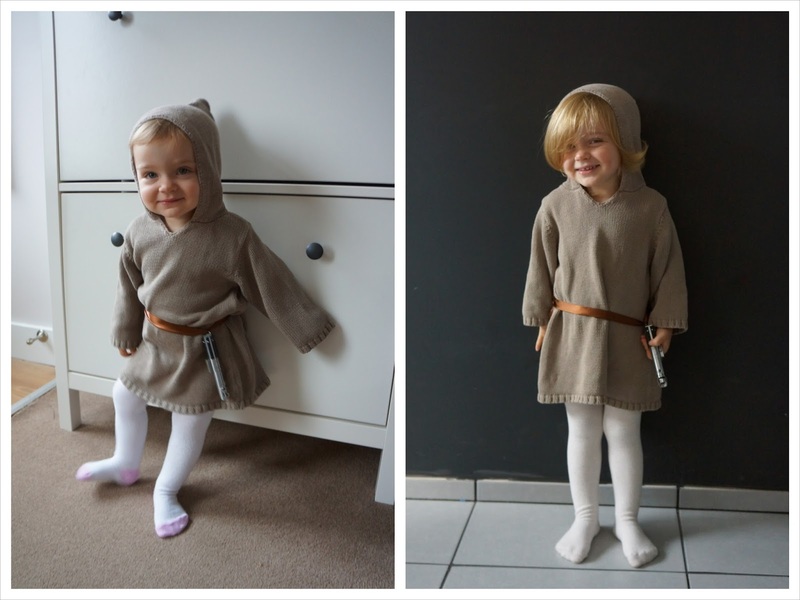 Mini Luke Skywalker! Complete with her mini-size actual Luke Skywalker light saber replica, courtesy of her Star Wars geek enthusiast dad. I loved this outfit last year, and I loved it this year too, I thought it was darn cute and would be a shame not to have it. We shall see what the next year brings - I doubt the dress will fit anymore so we will have to come up with something new, ha ha. Here is the comparison between this year and last year - my has she grown! How was your Halloween and what outfits did you choose? so cute!! Lovely to see the comparison to last year. Definitely do it until she's 18!!! We went for a witch for Big Red and a pumpkin for Little Red that happened to be a costume for a pug by accident..... ah well it's a story to tell her when she's older! Ha ha :) And remember to mention also that it is the proper Luke Skywalker light saber she's holding :D Not just any light saber! Yeah, it is amazing how fast they grow. It was lovely seeing those old pictures and compare them to what she is now, exactly one year later. So glad the dress still fitted her as we had nothing else for her to wear for Halloween! Thank you :) I was really happy with this outfit too :) Thanks for hosting!